Commander Ponds is a playable character from LEGO Star Wars III: The Clone Wars. He is based on the clone trooper of the same nickname in the Star Wars universe. Ponds has the same design as a normal Clone Trooper character, however has some additional flashes of dark red markings. These markings are present on the helmet's crest and most of the sections above the visor, and also in a small area on each side of the base of helmet. Ponds' arms are also coloured dark red as opposed to the standard white. 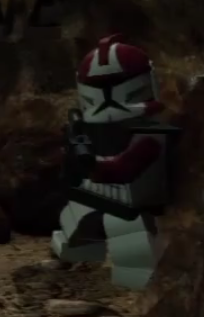 This character has several accessories- a black kama, and at times, a black rangefinder, which can enable the Commander to take control of a group of a group of clone troopers, and order them to attack a specific target. Ponds uses a blaster as his main weapon, and can also throw EMP grenades to stun droids. He also has the ability to jump, grapple, and place bombs in designated clone trooper areas. CC-6454, nicknamed Ponds, was a clone trooper commander who was assigned to High General Mace Windu who he first met during the first battle of the Clone Wars, on Geonosis. As the commander of Lightning Squadron, a division of the 91st Reconnaissance Corps, Ponds continued to serve under Windu throughout the Clone Wars including in the Battles of Ryloth and Malastare. However, after an incident caused by Boba Fett, which resulted in the Star Destroyer Endurance crashing with Ponds aboard it, the commander along with other Republic personnel were captured by Fett's team of bounty hunters, including Aurra Sing and Bossk. To lure Windu out so that Fett could attempt to kill the Jedi to get revenge for him killing his father, the bounty hunters opened a transmission demanding that Windu show himself, or the Republic personnel would all be killed. To show the Jedi that they would carry out on their threats, Sing then executed Ponds and tossed his corpse into space. This page was last edited on 9 January 2016, at 20:43.